Counselling at Off The Record is for young people who are having problems. Whether it’s depression and mental health concerns or issues with parents, friends or school, talking to a counsellor can help. When a young person contacts Off The Record they can expect a friendly welcome, to be treated with respect and given support to make their own life choices. A young person can expect to be helped by a supportive and non-judgmental counsellor. Many young clients have told us that they feel happier after they have seen a counsellor and that counselling has helped them to feel better about their problems. When someone contacts OTR we take basic details including availability for counselling, school and GP details (although our service is confidential and we will not contact either of these). The young person needs to live, work or study in Richmond borough and be between the ages of 11-24 to be eligible for counselling here. Young people can be referred by a GP, teacher, social worker, or parent or they can also self-refer. The fact that they request to see a counsellor is confidential, as is what they say to the counsellor, unless the counsellor is worried for their safety. If the initial contact is made by someone else – like a parent, carer or other professional, we then ask that the young person also contact us. This is because, as a service for young people, we are very much led by them. We want to know that it is their choice to attend counselling and our experience is that involving them in the process from the beginning leads to a better outcome. However, if they are very young or nervous of speaking to us we can be more flexible about this requirement, so just let us know. 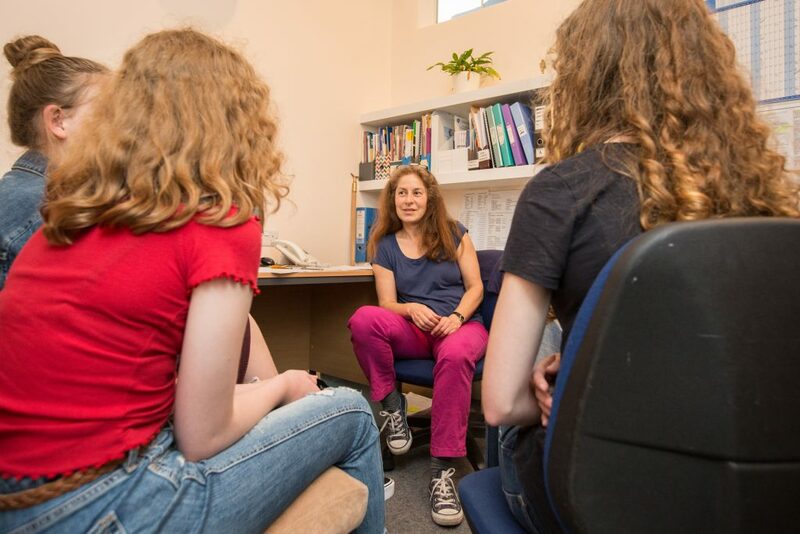 After the young person has contacted us confirming they’d like counselling we can then offer an initial one-off counselling session usually within a couple of weeks, while they wait for a weekly slot. When a slot becomes available we offer 12 sessions of weekly counselling. There is usually a wait of a few months for a suitable slot to become available. Once the young person is assigned a counselling slot he/she will see the same counsellor for 12 sessions. Occasionally a young person and a counsellor are the ‘wrong fit’ and if happens we encourage the young person to request to see a different counsellor. All our counsellors are trained, in a variety of counselling disciplines, and attend regular supervision as required by their professional body. Our counsellors also have extensive experience of working with young people. Off The Record’s approach to counselling could be described as person-centred which broadly means that the young person is at the core of the support offered. That support includes choice and is holistic and tailored to the young person’s needs and wishes. Counselling offers a safe space for a young person to share their difficulties. It isn’t always easy to talk about what is worrying them. Often they don’t know what the problem is, they just don’t feel ‘right’. Counselling offers them a space to think; to look at their life and how they feel, and to gain some support as they ‘reframe’ their life and work towards making choices that are right for them. Counsellors do not offer advice or opinions about what path to take; they are there to facilitate and support the young person as they think about their difficulties. Off The Record Counsellors create an environment and relationship with their client that allows for supportive engagement and helps young people learn to cope with and solve their own problems. We understand that parents are concerned for their children, particularly when they are struggling and in need of extra support. Sometimes parents can find it difficult that their child may need help outside the family. But even within a supportive family it can help a young person to talk to someone independent, as they often worry about the impact of their emotions on their family. It can be empowering for a young person to share what is going on for them with a non-judgmental person outside the family, and this usually has the effect of improving family relationships too. We are always happy to talk to parents about the process of counselling and offer them any support we can, however we are unable, due to the confidential nature of the counselling relationship, to discuss anything that your son/daughter has talked about in their sessions. If we are worried about the young person’s safety we follow procedures laid out in our Child Protection and Safeguarding Policy, and this reflects our commitment to provide a safe and confidential counselling service for all our clients. If we believe that a young person is at risk of serious harm (or may seriously harm someone else), we would then make a decision as to who the best person is to share information with in order to support them – this may be parents, GP, police, or other appropriate services. Our policy incorporates many aspect of current legislation, government statutory guidance and BACP (British Association for Counselling and Psychotherapy) guidelines. What can I do to support my child when they are in difficulty? Be available to talk if your son/daughter wants to talk, but try to listen rather than give opinions. Hold back from offering solutions and trust that your child can find their own solution. You can be interested and caring without intervening. Reflecting back what they say can be more supportive than making suggestions e.g. “that sounds like it was very challenging” not “why didn’t you say something back?”. Be patient – life problems do not disappear overnight, particularly if they have been around for a long time – making change is challenging and can take time. It’s okay to make mistakes and get it wrong – this is an essential part of learning. Having confidence in your young person’s ability to cope, and telling them you are proud of them for getting help/staying with their struggle will boost their confidence. Focus on other aspects of life; schools, friends, sports, social etc. and point out what they are doing well. They don’t always see this themselves, and it can strengthen their coping skills. MindEd elearning to support young healthy minds. How can I support Off The Record? The counselling service is free (though we ask those over 18 who work and can afford it, to make a contribution of up to £10 per session). However, we are a charity and we’re very much reliant on raising yearly funding; community fundraising is a vital source of our income. If you are happy with the service and would like to make a one-off contribution we’d be very grateful; you can do this through our website or the donations box at OTR. Perhaps you would like to organize a fundraising event, run a marathon or anything else – if so please do get in touch with us to talk about this.